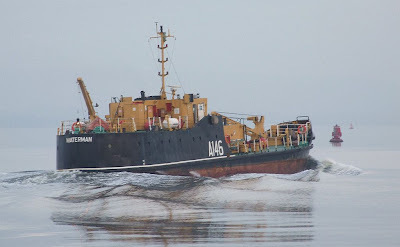 One of the Serco-Denholm managed vessels in the fleet of naval auxiliaries based at the Great Harbour is the water carrier WATERMAN. Built at Dunston's yard at Hessle, she dates from 1978, and is 40.11 metres long. A Mirrlees 6-cylinder engine drives her single screw, and gives a speed of 11 knots. She is 263 gross tons, and was returning from Glen Mallan, where she had been delivering water to FORT ROSALIE, which has been berthed there for a few days.